When using Medicare and DVA Online Claiming, claims might be rejected and or receive error messages. If this is the case, a message in the Invoice History will suggest to look for the error message details. Below is a list of the most common error messages and how you can rectify the error to successfully claim when resubmitting the invoice. 2. 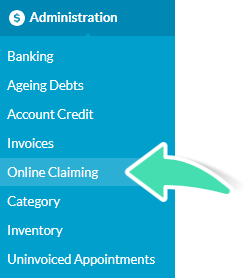 Click on Online Claiming under Administration. Change the provider number on the invoice – Select item > Change Provider > Change Provider number > Click save. Resubmit Claim (Reset). Change the item number on the invoice – Click on item > Click Edit Service Code > Click Save. Change item code for the Service for future invoices – Practice > Setup > Services > Click on Service > Change item Code > Click Save. The wrong referrer might have been chosen while submitting the invoice – Check the Referer number in the Claim tab, if this is the case, select the appropriate referer when resubmitting the invoice. The Doctor provider number in the Contacts section might be wrong – update it in Contacts > Select Doctor > Change provider number > Click Save. If the provider number selected when generating the invoice is wrong – Change the provider number for the item (Select Item > Click Change provider > Select appropriate provider number > click Save). The Client Date of birth of the Client might be wrong or missing in the Client Profile – If it is the case, update Client DOB in Client Details. The invoice date might be before the date the item was invoiced. If so, change the date of the invoice to be the same or later than the most recent item invoiced – Click on the invoice date > Change Date > Click Save. The item date or the invoice date is in the future, correct the appropriate date – Select item > Click Edit Date > Change Date > Click Save. Maximum number of services for this item already paid: The number of session approved for this claim has been reached. If you think this is not the case, contact Medicare of DVA. Benefit has been previously paid for this service: A claim for an item invoiced on the same date has aleady been paid. Verify if a previous invoice has a wrong item date. Change the relevant date and submit the invoice again. No benefit if requested by this provider at date of request: The Referral is expired or the Referrer provider number has not been updated. Update the Provider Name and Provider Number in the Case to match the new Referral. We recommend creating a new Case for new referral or you might need to delete the previous referral, save the changes and add the new referral. Provider cannot refer/request service at date of request OR Referring provider number not open at date of referral: The Referrer Provider Number has changed. Update the Provider Number of the Referrer in your Contacts and resubmit the Claim with the new Provider Number. Update the Medicare or DVA card details in Clients > Health section and resubmit the claim. If you come across other error messages and you are not sure how to deal with it, please create a ticket so we can assist and add this error message to the list.